This is the guy who is now — and this should have been obvious to anyone even back then — a 28-year-old billionaire. We would never resort to anything so crass here. Which is why this blog earned $4.82 last month. But we think Zuckerberg won’t mind if we steal his basic idea. 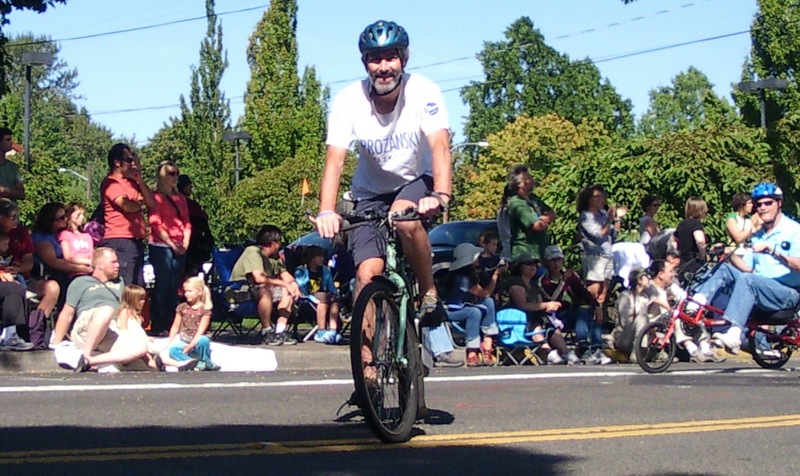 … in which we show you photos of two Eugene celebrities on bikes, and you tell us who does more for the cause of Eugene’s urban cyclists. I think we’ll take BikeMash public next week. So I’ll see you all on Wall Street. Speaking of the $4.82 this blog brought in last month, you’ll have to pardon me while I do a little self-promotion. I mention this fact in a Q&A profile being that was ‘s supposed to be posted Wednesday on Oregon Live, as this blog is — quite incredibly — part of the Oregonian’s Oregon News Network. Yeah, there’s a Q&A with me there. I guess I’m not anonymous anymore. In the Q&A I mention that the $4.82 will buy me a pint of microbrew. 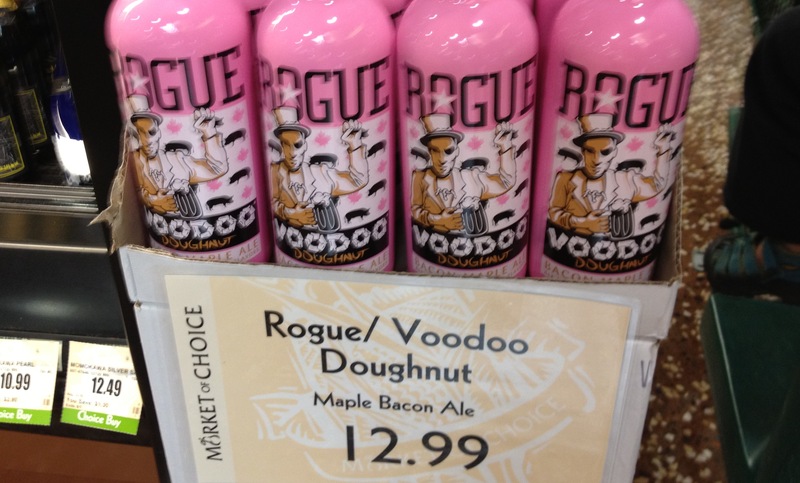 So I will admit right now that I’m a beer snob. I was amazed when, about five years ago, I went to New York City — the center of the universe for everything from fashion to finance — and I found that there are essentially two kinds of beer sold in Manhattan: Bud, or, if you want the good beer, Heineken. Needless to say, I haven’t been back to New York since. But if we need more evidence that all good things eventually become parodies of themselves, we must examine the Northwest craft beer scene with a stern and critical eye. Well, let’s just not mention this to anybody east of Bend, OK? Just a regular bike, locked up outside House of Records on 13th, right? Maybe this is the flip side of your grandfather telling you how he walked 8 miles to school everyday, uphill both ways. Some this guy will tell his wide-eyed young grandkids how he rode his bike to 8 miles to work everyday, downhill both ways. Sure, I see bikes without seats all the time. And missing wheels. No chain? Would someone steal a chain? No, no. Did you catch the tattoos? 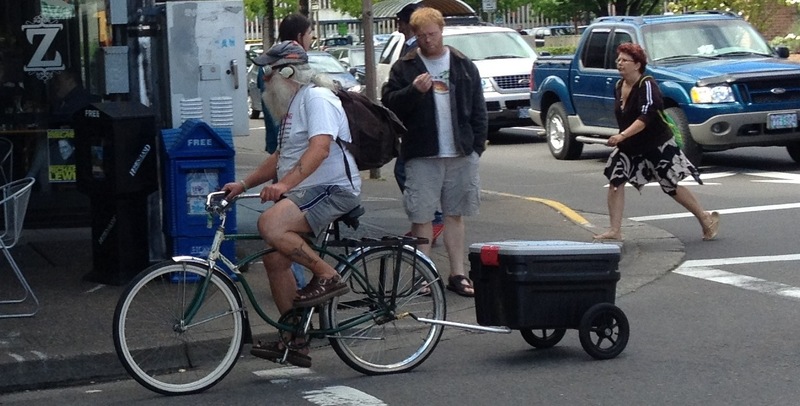 I stopped at the corner of 12th and Pearl and he sailed past, riding a wheelie. He continued south in the bike lane, riding the wheelie the whole way, continued directly through the red light at 13th, still riding the wheelie, and on and on all the way to 18th, where he turned left and headed toward campus. His front wheel didn’t touch the ground once. He’s apparently raising money to help bring clean water to people in Africa. 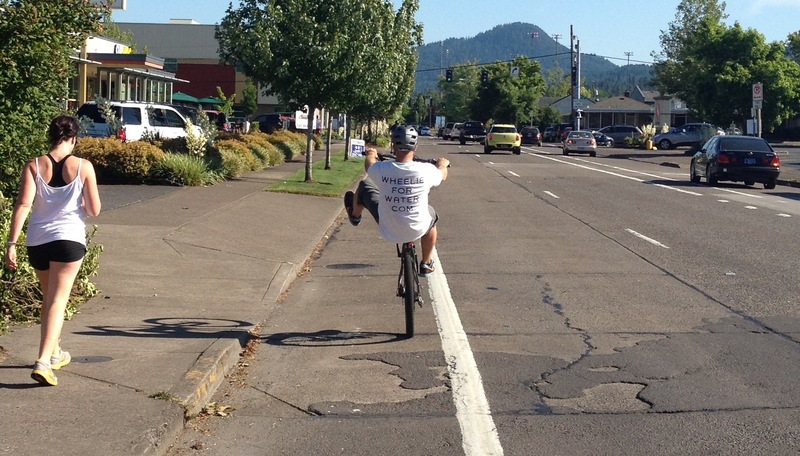 He’s trying to set a world record wheelie ride — shooting for 12 miles. Yes, I saw this guy at the Olympic Trials. 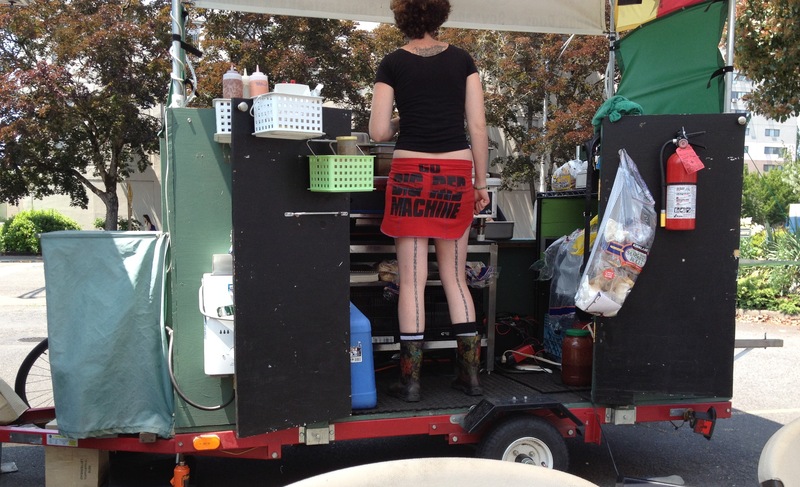 I’m not sure if he is from Eugene or not. Wheelie Guy is from Salem. I saw him on Breakfast on Bikes, your slightly staider and more wide-ranging counterpart from a few miles downstream. I know the Wheelie Guy! Thanks for the mention in your post, and you snapped some good shots as I was riding away too. I discovered this article when one of your readers visited the Wheelie For Water website and purchased a shirt to help support the efforts for clean water in Africa. The world record is still in my sights and all I need is a track to ride the wheelie on. Eugene, being track town and all, I thought, what better a place to start looking. And the bike friendly people in town seem to be taking a liking to the one wheel riding quickly. Hey Chris! Good luck with this. Yeah, I’d like to see you set the record at “historic” Hayward Field … but you know how the UO is. I tried to say something to you, ask you what you were doing, but you had head phones in. You just smiled and nodded. Roll on. Glad you were able to figure out who the “Wheelie Guy” was. This is a great blog! I’m glad I stubbled upon it. 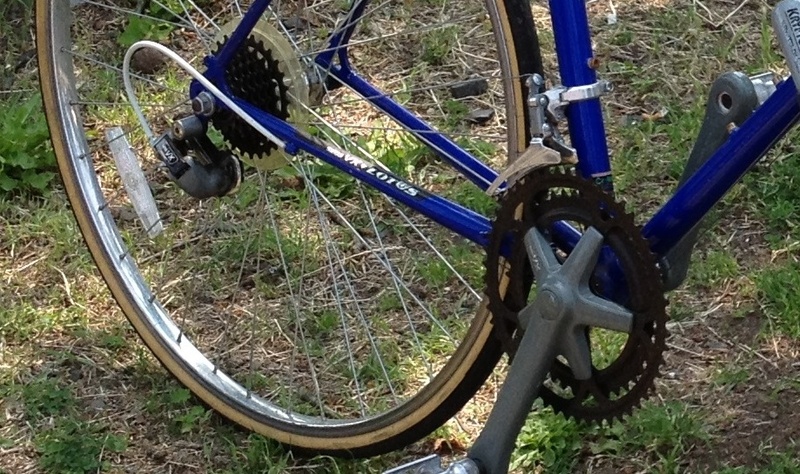 Did you ever figure out why the bike was without a chain? Thanks! No, no idea about the chain. 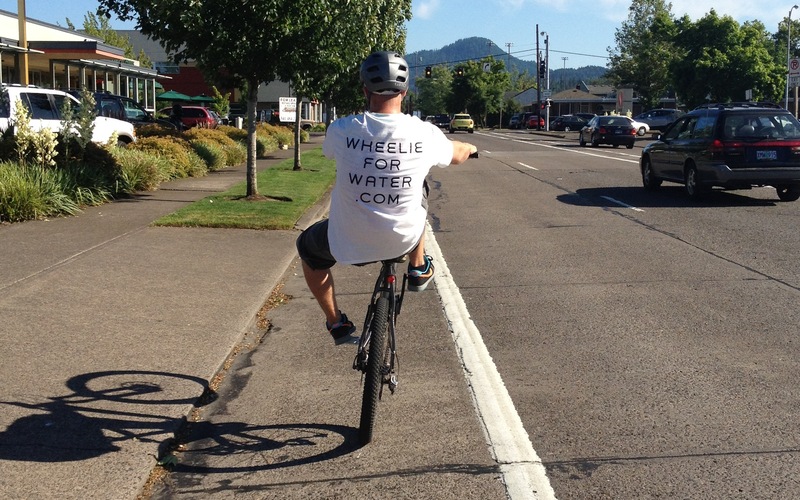 Sad news–the Wheelie for Water bike was stolen Wednesday. There’s more information on the wheelieforwater website. Humbly accepting donations to go towards a new set of wheels. Haha the Wheelie For Water guy! 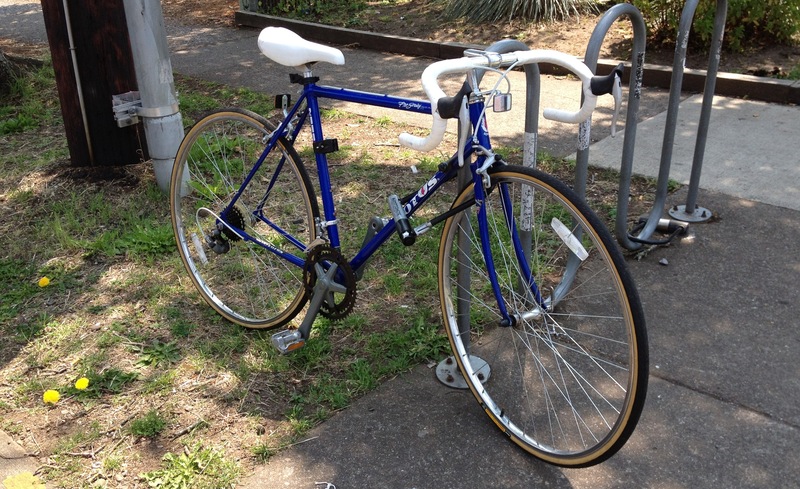 Wheelie bike was recovered earlier this week from Eugene Police. The flow will continue! See you around town.